I can't believe July is over today -- and we had ambitious plans to make our July such a mucho jam-packed month of Latin food deliciousness! Oh well. It has been a crazy month here and the last two weeks of the month has been deliriously HOT too, which no doubt contributed to the busy-ness effect. Like our snow-filled December, when we had to wade in snow and wet slush, every little task seemed to take double or triple the effort in 30+ degree Centigrade weather, and in twenty years in Vancouver, I've never sweated so much as I had in the last ten or so days! 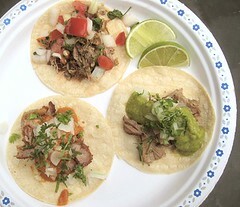 I'm thinking of how to segue into the topic on hand, which is our shredded beef and tripe tacos from our last taco night. I'll leave it to our handful of readers to fill in the blanks. Perhaps it is the heat talking, because I have been craving for something light -- and something light that's not a salad. Lately, I've been strangely enamoured by the the idea of "white" or "light" beef. I suppose the months of browning beef has finally gotten to me -- and I wanted to try my hand at the "lighter" preparations of beef. 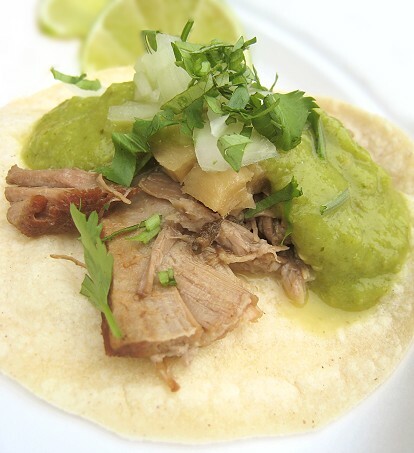 Our "dancing cilantro beef" is a good place to start, but in that dish, the beef is braised in a bit of soy sauce, which, even though diluted with water, still results in that deep, round, caramel-y, brown flavour. When I cooked this two or so weeks ago, it wasn't as hot as it had been in the past few days. Hence, I cooked this dish indoors. The past week, when the temperature inside the house reached 35 degrees Celcius, I've been using our grill as our all-purpose cooking device: baking pasta out there, steaming, poaching, and braising meats. Not actually grilling, because the heat was just too intense, and I couldn't bear to stand in front of the grill for long periods of time. This filling is actually a very simple poached beef dish. I used a combination of beef cuts, oxtail and veal breast, which I blanched first to get rid of the blood and the impurities. The tripe was a tad of an afterthought, because I had also been craving "offal" and/or "variety meats" lately. After blanching, I put the oxtail and the breast in water with an onion, a head of garlic, a teaspoon of Mexican oregano and epazote. After about an hour or so of simmering, I added the tripe (which had been washed and cleaned thoroughly), because the tripe actually needed less than hour to become tender, as it had already been partially cooked before being sold. When everything was fork tender, I turned off the heat and let the pot cool. I did this the day before because the oxtail and the veal breast would render out fat, which I wanted to let cool and congeal so I can take most of it out. The next day, I took the pieces and shredded by hand. I suppose one can add some of the liquid to make the filling more wet, but I didn't because I didn't want it too wet. The "wetness" I desired was just the moisture clinging to the pieces of meat. The whole thing needed seasoning and it was good to go. 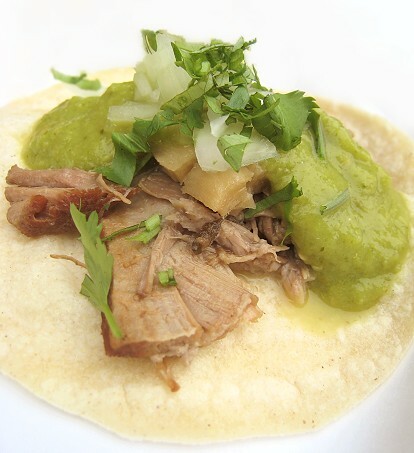 This specific taco was filled with our light but oh-so-flavorful beef and tripe filling, tomatillo salsa (salsa verde), chopped onions and cilantro, and a squeeze of lime. Happiness. Bring a pot of water to a boil. 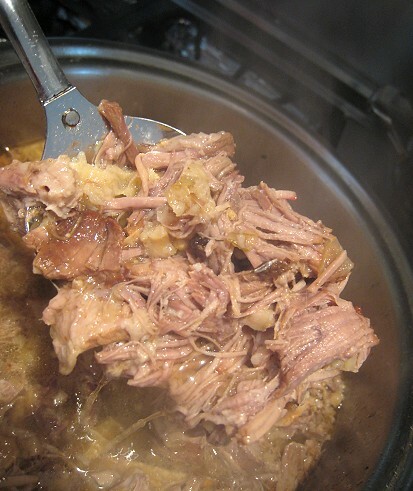 When boiling, add the oxtail and veal breast pieces until the outside changes color. Take beef pieces out of the water. Discard dirty water. 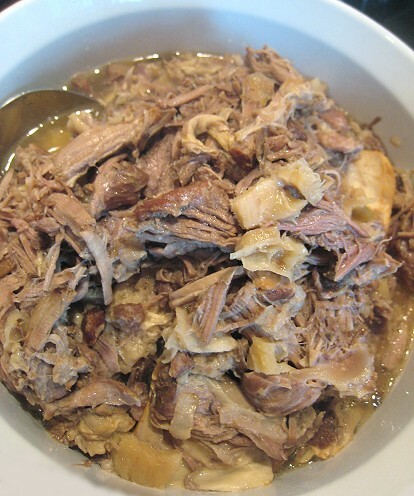 In a pot, add oxtail and veal breast pieces, the onion, garlic, Mexican oregano and epazote. Add water to cover. Bring to a boil, then turn down to low and simmer for about 2 hours. In the meantime, throughly wash the tripe to get rid of any "bleach-y" aroma. Add the tripe to the simmering pot. Simmer for about 45 minutes to 1 hour. Check the pot. 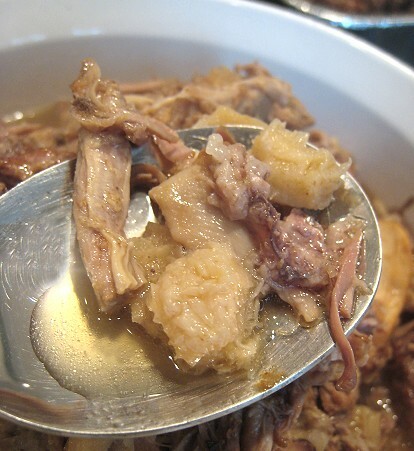 If tender enough, take out tripe and cut into small pieces. Also, shred the oxtail and veal breast pieces. You may keep as much or as little of the liquid as you like. Season to taste with salt and pepper. Tripe! My heart be still! Love dishes like this! It's so comforting! 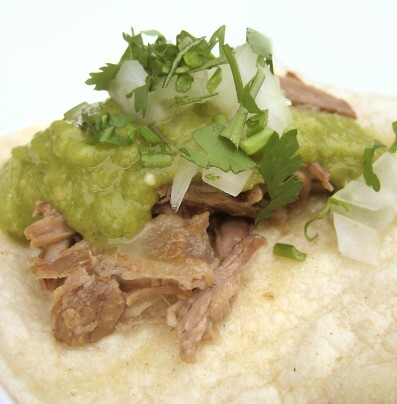 I would have never thought of using tripe and ox tail in a taco filling but as I love these cuts (yay for offal!) I'm sure I would love this too! Hahaha... and they were melt-in-your-mouth too! It was quite nice; very big flavor, but still light-tasting.